1. EMA60 and EMA15 are both pointing up. 2. EMA5 is above EMA15. When we have these three conditions, we know that we’re in an uptrend. happens, we enter with two lots. - Stop Loss: We place a protective stop loss at -40 pips (4H Time Frame, 60 min Time Frame 30 pips, Daily Time Frame 60 pips). 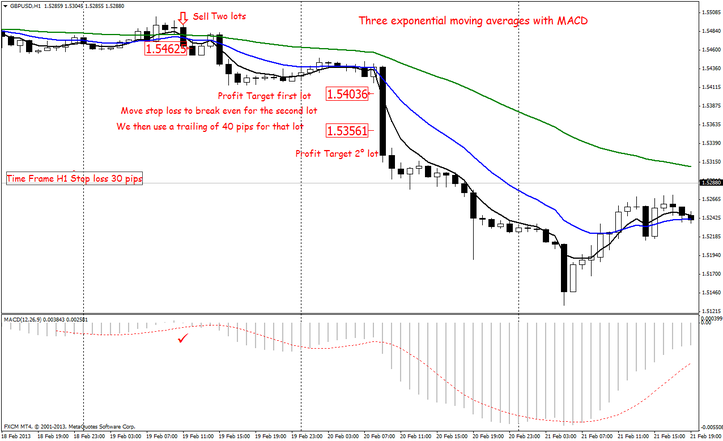 - Profit Targets: When we have 40 pips in profit we exit one lot. high. That way, we can follow the trend until the end. 1. EMA60 and EMA15 are both pointing down. 2. EMA5 is below EMA15. 3. EMA15 is below EMA60. When we have these three conditions, we know that we’re in a downtrend. We can also move stop loss to the recent low each time price break that low. That way, we can follow the trend until the end. In the pictures belowThree exponential moving averages with MACDin action. Three exponential moving averages with MACD: Template. 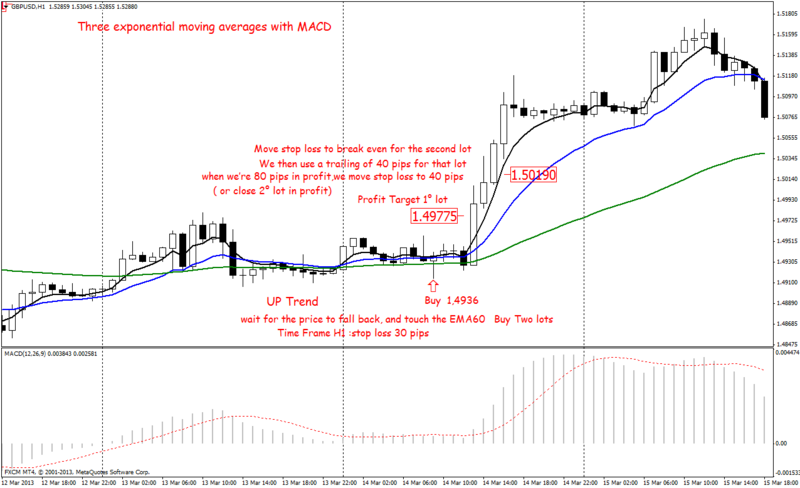 Share your opinion, can help everyone to understand the Three exponential moving averages with MACD trading system.